← What Name Would You Like? Sienna Plantation is now a large residential community located off State Highway 6 in eastern Fort Bend County. The land where this subdivision has grown has a long history as a sugar and cotton plantation beginning with original land grants of the Old Three Hundred. In 1824, this was part of Stephen F. Austin’s Oyster Creek Settlement. The original land grants that would become Sienna Plantation were awarded to David Fitzgerald, Thomas Barnett, and Moses Shipman. David Fitzgerald of Savannah, Georgia, came to Texas in 1822 as a widower aged over fifty. Fitzgerald fought at Anahuac, the small American community on Galveston Bay, in 1832. This was a port of entry for American colonists that had been established as a Spanish fortress ten years before. In 1831, Kentucky-born John Davis Bradburn, who was serving as a colonel in the Mexican army, took command of the garrison at Anahuac. Bradburn confiscated some colonist’s land, declared martial law and arrested several of them after they protested. One hundred sixty angry colonists, including David Fitzgerald and Daniel Shipman, the son of Moses Shipman, attacked the garrison to rescue their friends. Some say this was the start of the Texas Revolution. Thomas Barnett was born on January 18, 1798, in Logan County, Kentucky. Before 1821 he moved to Livingston County, Kentucky, where he was sheriff for two years. In 1823 he moved to Texas as one of Stephen F. Austin‘s Old Three Hundred and on July 10, 1824, received title to a league of land on the adjacent north side of the David Fitzgerald league, but never lived there. Thomas Barnett was one of the signers of the Texas Declaration of Independence. David Fitzgerald died in 1832, and his plantation became the property of his daughter, Sarah, who had married Eli Fenn in Georgia before the Fitzgerald and Fenn families moved to Texas. John Rutherford Fenn, the son of Eli Fenn and Sarah Fitzgerald Fenn, was born in Lawrence County, Mississippi, on October 11, 1824. He served as a second lieutenant in the Confederate Army during the Civil War. In 1852 he married Rebecca M. Williams and the couple had four children. The Fenns settled on a plantation they called Duke on Oyster Creek, where they lived until 1872, when they moved to Houston. 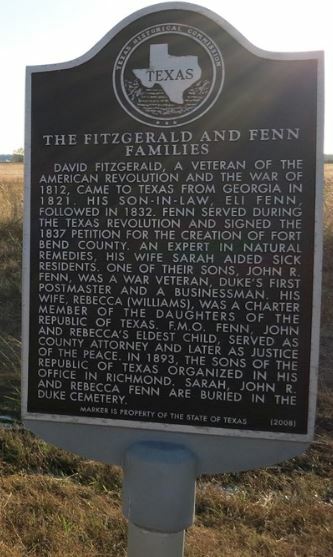 Fenn was first vice president of the Texas Veterans Association, an organization of those who had served prior to, during, and immediately after the Texas Revolution. He died in Houston on November 23, 1904, and is buried in the family cemetery at Duke, Texas. This location on the northeastern high bluff of Clear Lake provided an ample supply of water for steam engines and led to the construction of railroads here by the mid-1800s. The area developed as a major shipping point with a store, hotel, livestock pen, and sugar mills. It was named for Duke Hessey, the storekeeper. 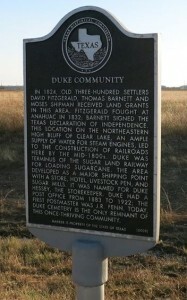 Duke was also the terminus of the Sugar Land Railway for loading sugarcane. The Sugar Land Railway Company was chartered on April 14, 1893, in the interest of Edward H. Cunningham and Company, to build from Sugar Land to Arcola. Duke had a Post Office from 1883 to 1922; the first Postmaster was John Rutherford Fenn. Today, Duke Cemetery is the only remnant of this once-thriving community. A large portion of the original land grant was sold to South Carolina planter Jonathan Dawson Waters in the middle 1840s. By acquiring the whole league in 1850, Waters became the owner of one of the largest cotton and sugar plantations in Texas, which he called Arcola. His operation included his own wharf along the Brazos River where ships loaded and unloaded commercial goods. The Houston Tap Railroad was built through the area of the plantation in 1858. Arcola became a railroad junction in 1878 when the Gulf, Colorado and Santa Fe also built through the county. After Waters’ death the plantation lands were purchased by Houston businessman and civic leader Thomas W. House in 1872. By 1884 the community had a sugar mill, two steam gristmill-cotton gins, two general stores, a Baptist church, and a school. The Galveston Daily News of March 24, 1892, reported on the “New Picnic Grounds” at Clear Lake. An associate of Thomas House and the Reconstruction Mayor of Houston, Thomas H. Scanlan acquired the plantation next. After his death in 1906, Scanlan’s daughters, as part of their estate, entrusted the property to the Scanlan Foundation, an organization benefiting Catholic charities, and in the 1950s and 1960s the Houston diocese operated the land as the Cenacle Retreat under the direction of the Cenacle Sisters. They chose the name Sienna Plantation in honor of the Siena area of Tuscany in Italy, and the retreat operated until 1972. By 1978 the land had changed hands again and developers sought approval of the Sienna Plantation project, a large planned community. As you drive through this community now and see a street named Scanlan Trace, or Fitzgerald Way, or Waters Lake, or Shipmans Landing, or Fort Bend ISD’s Scanlan Oaks Elementary School, perhaps you will have another thought as to the footsteps of those who came before you in this area. This entry was posted in Fort Bend County History, Fort Bend ISD and tagged Arcola Texas, Duke Texas, Edward Cunningham, Gulf Colorado & Santa Fe Railroad, Houston Tap Railroad, Old Three Hundred, Oyster Creek, Scanlan Foundation, Scanlan Oaks Elementary, Sienna Plantation, Stephen F. Austin, Sugar Land Railroad, Texas Revolution. Bookmark the permalink.